Shifting Ice and Changing Tides, an all-female, human and wind-powered ski and sail expedition to Greenland, began with a simple email in December 2012. It was a passionate confession by California SheJumps Coordinator Meghan Kelly. Meghan was hungry for a ski adventure and looking for some partners in crime. It’s not everyday that you receive such an invitation and for our team, it was an offer that we couldn’t refuse. We were a group of five female skiers, with a mixed background in competitive big-mountain skiing, backcountry skiing, and ski mountaineering, and like Meghan, we were looking to challenge ourselves in a new environment. Within a week, we were on Skype, researching ski locations and grants to make our plan a reality. The breakthrough came as we were applying for the Polartec Challenge Grant in early 2013. The grant awards projects that focus on “human-powered” expeditions, and as a group of eager backcountry skiers, we decided to take this concept a step further by trying to eliminate our dependence on motor vehicles during the expedition. Cutting out motor vehicles led us to choose a sailboat as our means of transport. Which led us to choose Iceland and Greenland as our destinations, as their fjords and mountainous regions are best explored by boat. After choosing our destinations, it was hard to ignore the obvious global issue affecting the region: climate change. Being a group of skiers who rely on the natural environment to make our sport possible, we’re constantly thinking about what climate change means. Our conversations quickly turned from discussions about unexplored ski terrain and first descents to the realization that in a short amount of time, many of them may soon be last descents as the region warms. That’s when our expedition took on a whole new meaning: we weren’t just using the experience to challenge ourselves – we wanted Shifting Ice and Changing Tides to become a vehicle for climate action. Organising the logistics of the expedition was no simple feat. The plan was for our team of six to board La Louise (a 63-foot hand-built schooner) in Ísafjörður, Iceland on March 29. From there, the intention was to sail to the southern tip of Greenland and then north along the west coast to Nuuk, stopping to explore fjords and ski first descents down new, exciting, and remote terrain. The expedition wasn’t just about skiing. We collaborated with Adventurers and Scientists for Conservation, who connected our team with environmental research projects including its in-house marine microplastics study, which analyzes water samples from oceans for levels of dangerous microplastics. In the three samples collected by our team, there was an average of 10 pieces of plastic per liter of seawater. We were astonished at the human impact in regions that are so remote we could go three to four days without seeing other people. While the research aspect of the trip was a simple goal to reach, others were less straightforward. Before setting out on the expedition, our team planned to bring back a story that explained the impacts of climate change and its affects on the subarctic, as well as, our local stomping grounds, seen through our perspective. In doing so, we hope to of spread awareness and educate people involved in the snow sports industry. However, understanding climate change in a region as a visitor can be a difficult task and trying to substantiate it can be even tougher. This was one aspect we struggled with, and only after reflecting on particular highlights of trip were we truly able to put the pieces together. Before leaving Iceland, our research projected that that we would not be able to access land for at least 300 nautical miles north of Cape Farewell (the southern tip of Greenland) due to sheets of sea ice and field ice (packs of icebergs that are formed by calving glaciers and transported by wind and ocean currents). However, on reaching Cape Farewell, five days after setting sail from Ísafjörður, we found that the sea ice had been pushed further north along the east coast of Greenland, opening up an area that is usually inaccessible during April. The discovery also came with a surprise benefit as the area had some of the best potential ski lines on our route. The sea ice remained north for nearly five days, allowing us to explore this incredible terrain. As excited as we were to ski this area, it was hard not to wonder why the ice was moving in such an unexpected way. Was it a freak weather event or a pattern that only occurs on rare years? It was only after speaking with locals in the nearby town of Nanortalik that we managed to shed some light on what had happened. An explanation came in conversations with the head of the office of tourism in Nanortalik, Niels Jespen, a Danish native who has lived in Greenland since 1969. Niels explained that varied and unpredictable field ice patterns and weather were common in the region. Due to the proximity of the Gulf Stream and the Atlantic Ocean, ocean currents and the winds easily affect sea ice along Cape Farewell. He didn’t believe that the field ice had been through much change but rather our trip coincided with a rare opportunity. That is not to say that change isn’t happening. The extent and thickness of sheet sea ice in the West Greenland region is decreasing due to climate change. In the future, we can expect to see less sea ice in this region and greater variability in the ice that is there. These changes aren’t limited to sea ice either. In the 30 years that Niels has been living in the region, he’s seen the winters become milder and average snowfall decrease. He reminisced about ski events he used to run in the 70s and 80s, where local school children would race down a nearby hill in mid-winter, vying for the fastest time. Since the mid-80s, this has been impossible due to less snow falling and melting faster. He explained that “Climate change is a daily thing for us here, but I don’t think it is so hard in South Greenland as in North Greenland because South Greenland usually has changeable weather.” We personally did not experience many of the major environmental impacts hitting Greenland due to our southern location, but by hearing locals’ stories and learning about their history, we could comprehend the great losses the area has sustained. However, there is something that we do know for sure: humans have an incredible ability to overcome obstacles and achieve great feats. Nothing can be achieved by inaction. After all, our expedition started with just one act of boldness, just one email. Now is the time to take action against climate change and make a commitment to making a difference. What climate action will you take today? Born and bred as a skier in Australia’s Victorian Alps, Nat has pursued downhill, moguls, freestyle and free ride skiing since the ripe old age of two. She has competed, coached and traveled as a ski bum. 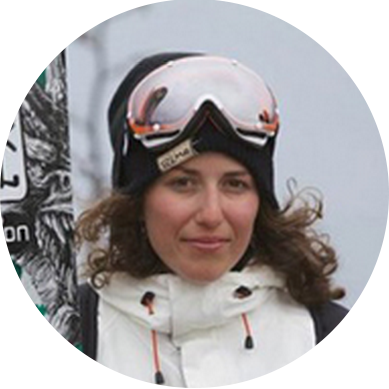 Following her graduation from university, she returned to competitive skiing in 2010 to compete on the Freeskiing and Freeride World Tour. Nat is now focused on qualifying for the 2016 Freeride World Tour and working on a range of projects, which includes helping to produce a short documentary film for Shifting Ice and Changing Tides and filming with Shades of Winter.